Hello! 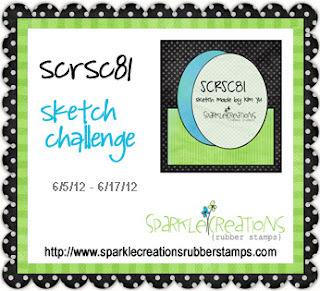 Welcome to week 2 of the current Sparkle Creations Rubber Stamps Challenge (SCRSC81)! The challenge is a sketch challenge (sketch courtesy of the fabulous Kim)! You have until Sunday, 6/17/12 @ 9 PM PST to play along. All of the challenge details are HERE. I never got a chance to ink up Baseball Oliver since he was released, so I decided to use him on my card today. 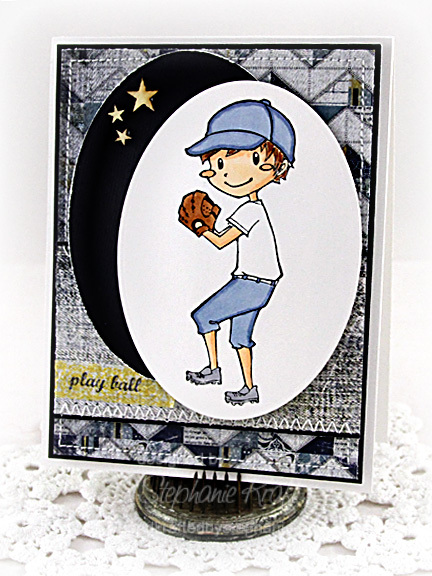 He also comes with the sentiment, "play ball", which I stamped onto a strip of Washi tape and added to my card. Accessories: Petite Oval Nestabilities - LG (Spellbinders), Markers (Copic), Washi tape (Hambly Studios), Wood veneer stars (Studio Calico), Foam tape, Thread, Sewing machine. SUPER fun card--love the papers and your coloring! I love that shadow from his hat! LOVE! Fabulous card!!! He is a cutie!! !